Hello my friends! I hope you are all doing extremely well. Today’s video is quite simple. 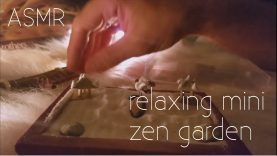 I’ll be opening, assembling, and playing with a little mini zen garden. It’s a very cute, calming little thing and I enjoyed playing around with it. I’ll be getting the June Patreon video done VERY soon, I promise! Thank you for your patience! I hope you enjoy this video :). I read every single comment that I get, so please leave your requests below and I’ll definitely see what I can do! Thank you all so very much for spending this time with me!